In addition to the two studies discussed above, there have been a considerable number of published reports examining the value of incorporating sFLC analysis in routine screening programmes (Table 23.3). Inevitably, there is a degree of repetition between many studies and only selected results are discussed in detail, with the aim of illustrating different aspects of the overall data. Table 23.3. Published screening studies investigating the contribution of sFLC analysis in routine screening for monoclonal gammopathies. CZE: capilliary zone electrophoresis; uIEP: urine immunoelectrophoresis: Igs: Immunoglobulins. The number/proportion of additional symptomatic plasma cell malignancies detected by sFLC analysis in the screening studies was very variable. Numbers would have been influenced by diverse factors such as the referral population, whether sIFE was used on all sera or only as a reflex test when there was an abnormal SPE result, and the proportion of sera that had an accompanying urine sample. However, the nature of the additional malignancies detected was similar, with a majority producing modest amounts of monoclonal FLC only (i.e. LCMM, NSMM, AL amyloidosis and LCDD). This pattern is unsurprising because every study employed either SPE or CZE on all sera, so patients with large amounts of monoclonal immunoglobulin production were less likely to have escaped detection. By way of example, Hill et al. reported the detection of two additional LCMM patients, Piehler et al. reported five LCMM, one NSMM and one AL amyloidosis patients, while McTaggart et al. identified two additional patients, one with LCDD and one with multiple plasmacytomas. While the diagnostic use of sFLC analysis is principally for the detection of plasma cell malignancies, B-cell leukaemias and lymphomas may also produce monoclonal FLCs. In many of the screening studies (Table 23.3), further investigation of patients with abnormal sFLC ratios but normal electrophoresis identified the presence of a B-cell leukaemia or lymphoma (Chapters 33 and 31). Of the nine additional gammopathy patients identified by Bakshi et al. , three had diagnoses of B-CLL/small cell lymphoma and one had an atypical B-cell lymphoma, while Holding et al. 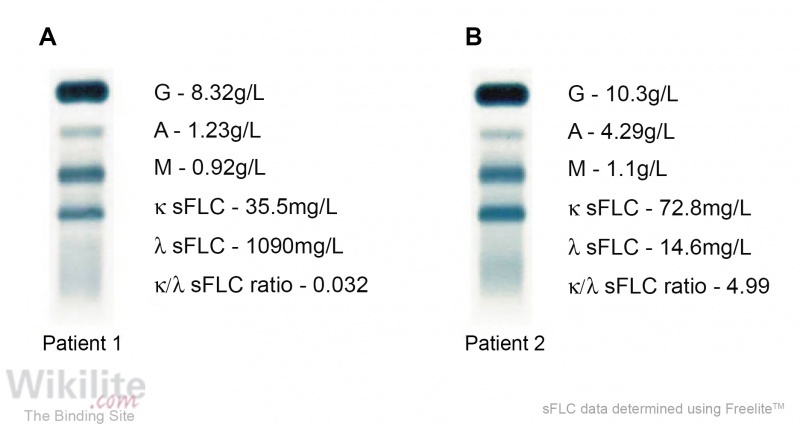 reported two B-CLL patients in whom a serum abnormality was identified only by sFLC analysis. In some instances, patients found to have abnormal sFLC ratios but apparently normal SPE results were ultimately diagnosed with IIMM. This was illustrated by Robson et al. who published the SPE results for 2 patients which appeared unremarkable but sIFE was requested due to the presence of abnormal sFLC ratios (Figure 23.1). sIFE revealed the presence of monoclonal IgD in one patient (MM) and a monoclonal IgA band in the other, that was hidden in the β-region of the gel (IgA MGUS). A study by Garcia de Veas Silva et al. confirmed that IgD monoclonal proteins are sometimes difficult to detect using SPE, and that sFLC measurements improve the diagnosis and management of these patients. Fulton and Fernando  reported 3 patients whose sera contained IgA paraproteins that were not visible by SPE but were identified by abnormal sFLC ratios. A common observation in screening populations is the number of patients with borderline elevations of the κ/λ ratio (i.e. ratios of ~ 1.66 – 3.0) but no evidence of a monoclonal process on further investigation. Such results are seen in Figure 23.2. Reduced FLC clearance when renal function is impaired can cause this elevation and a renal reference range has been derived for use with such patients (κ/λ sFLC ratio 0.37 – 3.1; Section 6.3) . Screening for monoclonal gammopathy in patients with renal impairment is associated with distinct challenges: patients may become anuric, in which case urine measurements become irrelevant, and urine samples are often not provided. For example in one renal screening study, urine samples were only obtained from 24 of 41 myeloma patients . 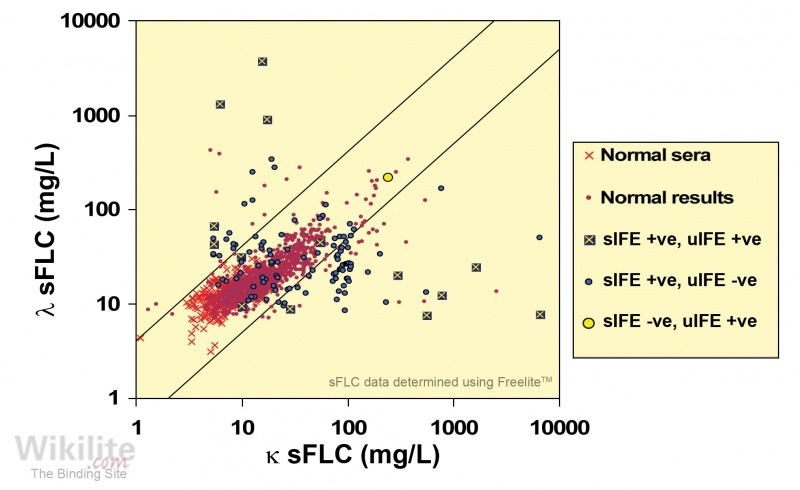 The increased sensitivity of sFLC analysis over urine testing identifies additional monoclonal gammopathies associated with renal disease; Gerth et al. performed a retrospective analysis of a cohort of patients with light-chain associated kidney disease comprising 143 patients with myeloma cast nephropathy, 12 patients with light chain deposition disease (LCDD) and 53 patients with AL amyloidosis. The authors reported that UPE alone detected 96.4% of cast nephropathy patients, 76.9% of AL amyloidosis patients and 55% LCDD patients. This compared with the sFLC ratio sensitivity of 96.8% for cast nephropathy, 100% for AL amyloidosis and 71.4% for LCDD patients. Use of a renal reference interval for the κ/λ sFLC ratio in routine clinical practice may lead to increased diagnostic accuracy for the diagnosis of monoclonal gammopathy (Section 6.3). The diagnostic utility of the renal reference interval was assessed in combination with SPE/UPE by Park et al. in a retrospective analysis of 471 patients who visited a nephrologist due to unexplained renal impairment. A total of 110 patients (23.4%) were diagnosed with MM, 346 were classed as “non-MM” and the remaining 15 patients had other plasma cell dyscrasias or lymphoproliferative diseases and were excluded from further study. sFLC analysis was particularly effective for screening patients for LCMM (diagnostic sensitivity: 100%), compared with SPE or UPE (diagnostic sensitivity: 58.6% or 69.0% respectively) (Table 23.4). The authors also commented on the difficulty in obtaining 24-hour urine collections (Chapter 24), and the benefit of including sFLC analysis in the initial diagnostic screen: an additional 24/252 (9.5%) CKD patients were newly diagnosed with MM following the introduction of routine sFLC analysis. The authors concluded that a combination of SPE and sFLC analysis (using the renal reference range for the sFLC ratio) was the optimal screening algorithm for detection of MM in patients presenting with renal impairment. IIMM: Intact immunoglobulin MM; LCMM: light chain MM. Table 23.4. Diagnostic sensitivity and specificity of routine laboratory screening tests for MM in patients with renal impairment . Koo et al. studied the diagnostic sensitivity of sFLC analysis in combination with other laboratory tests, to screen for a monoclonal protein in patients who underwent a renal biopsy. For patients with nephrotic syndrome, a panel of sFLC analysis (using the renal reference range) alongside sIFE and uIFE showed 100% diagnostic sensitivity for MM and monoclonal gammopathy of renal significance (Section 26.4.1). Whereas for patients with chronic glomerulonephritis, a reduced panel comprising sFLC + SPE (or UPE + SPE) had 100% sensitivity for MM. The authors concluded that the sensitivity of screening panels varied according to the presenting features of kidney disease. Modest sFLC ratio elevations (but no monoclonal FLC) are not exclusive to patients with renal impairment but are also observed in patients with polyclonal inflammatory and autoimmune conditions (Section 6.2 and Chapter 35), suggesting a possible increased bias towards κ sFLC production in these instances  Indeed, application of the renal range has been found to improve specificity when screening general populations . Whilst borderline sFLC results can be problematic, it should be remembered that urine electrophoresis can produce greater numbers of equivocal results . Analysis of a screening population by McTaggart and colleagues  led them to conclude that addition of UPE into their screening panel decreased the specificity through the identification of more “false-positive” results. Apart from application of the renal reference range, other authors have similarly explored the influence on specificity/positive predictive value (PPV) of categorising patients into groups with different degrees of ratio abnormality. Hill et al. found that κ/λ sFLC ratios of >3 or >5 were successively more predictive of finding a monoclonal gammopathy (by sIFE) or diagnosing a B-cell disorder. Vermeersch and colleagues  proposed the use of different sFLC ratio intervals to give likelihood ratios as an aid for interpreting screening results. In the screening population studied by Piehler et al. sFLC ratios of <0.05 or >10 were found to be 100% specific for haematological disorders. However, as with any diagnostic test, sFLC results should always be interpreted in the context of the patient’s symptoms and other test results (Chapter 7).